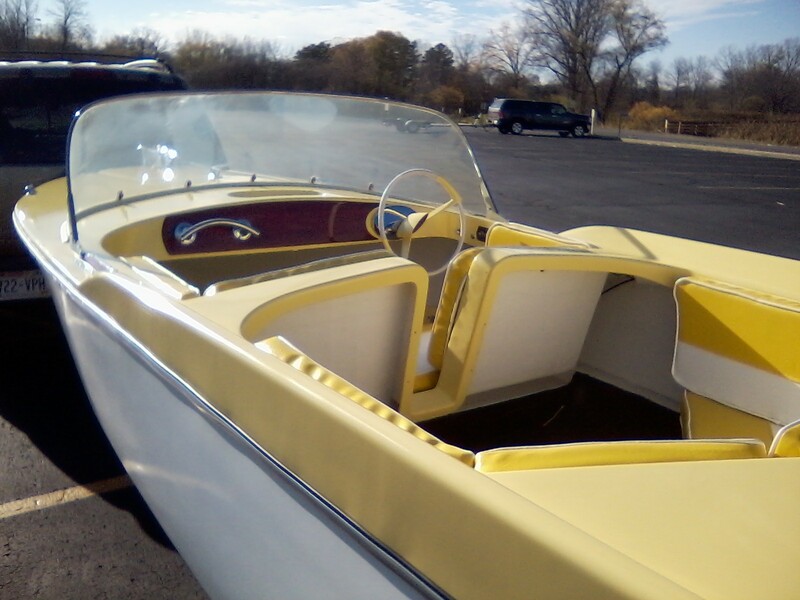 I'm planning on restoring my 1960ish Owens 17' Twinsport fiberglass boat. I'd like to hear thoughts on how I should go about that, which hardware I should install, what colors to finish it in, so on. I'd like to paint it in one of the original colors, if I can figure out what those colors are, I'd like to install original hardware, if I can figure out where to get that. Any advice welcome. We have actually owned the boat in the family for about 30 years, it's been used quite a bit as a runabout, fishing boat, it's been 'fixed up' several times in the service of toying around on the lake. I'm not one to let things die so I wanted to fix it up proper this winter. 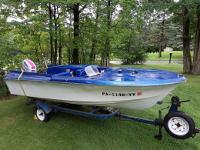 The engine is a Evinrude Surf six-o from the '80's, not in perfect shape but runs well. Maybe 63 Sabre could have some hardware left over from an Owens if he stripped it and saved it from a past boat. Maybe send him a personal message through this site and he could let you know. His might have been around 1958, but maybe hardware had not changed much. That Owens looks pretty good the way it sits from the picture. What exactly do you have in mind? New transom, soft floor, new seats etc? There is info on that model with brochure pictures in the glassic library. Just click on the top of the page and scroll down to Owens. Thanks for the replys. It looks better in the pic than it does close up. I've gone back and forth between a complete overhaul and a touch up project, but there are some major cracks that should be properly addressed, along with a lot of spidering in the fiberglass and a lot of flaking paint. 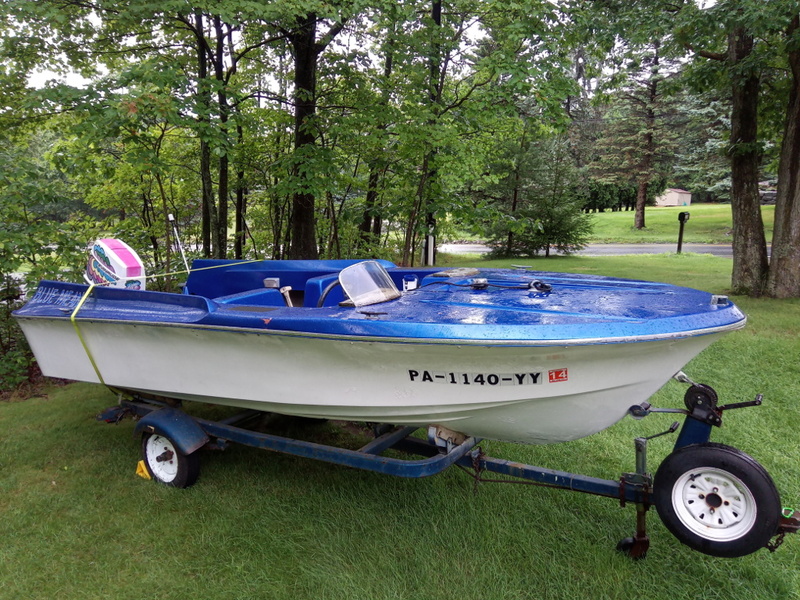 Here's my plan as it stands now: Remove the motor, remove all hardware, flip the boat, strip the off all the blistered white paint off the hull and redo with a good quality hull paint. Flip the boat back over and strip all the paint off of the top fiberglass, fix all cracks, fill, paint with a color that could be an original. Replace all modern hardware with something that could be close to the original hardware, or just period correct. Seats are actually okay, Floor is mostly okay. Would love suggestions/pictures of what would be the right hardware. What should I replace the gunwale trim with? Ambitious plan. Some suggestions for what their worth. You have all the right plans, strip it completely, seats, hardware, motor, etc. otherwise you'll have a dang hard time flipping it. If you can pick up some of those cheap Harbor Freight 4 wheel dollies you can set the flipped boat on them and be able to roll it around where you want it and also puts it at a perfect height to work on the bottom. Use a palm sander with 120 grit and clean up the bottom but try not to sand down to the cloth, same with topside. A good high build primer can be sprayed or brushed on and it sands down very easily, that usually is sufficient to fill some tiny cracks. I've been using Rustoleum enamel paint for all my work with a hardner added to it. Speeds drying time and you can sand the next day. Ask questions as you go along, there is plenty of help here for anything you need to know. Most of us have been there done that. above to bring it back. The side trim is from an auto supply store. Stick on stuff, once it's on it ain't comin' off. Great - glad I'm not way off base. That boat looks great - that's where I want to get to. I like the period correct color. If you or anyone else has suggestions on where to locate hardware that would be a help. I'm finding a lot of chris-craft stuff, some of it's really pricey. Probably find hardware on eBay. I bought a OEM bow light for as much as I paid for the boat and trailer. Buyers remorse after that move. Most of the manufactures of that time used different hardware or what was on the shelf so anything you get will pass inspection since your not "restoring" to original. When looking for hardware go with "free shipping". here's one example. (remove the two (-) dashes I put in the link) Have to put the dashes in so the link will post.